Tangled and True: help me. We are in the early stages of remodeling a kitchen, meaning we are still in the planning stages. Ryan and my styles don't quite match up. I love Meg's kitchen (pictured above), Lindsey's kitchen and Nicole's kitchen (via Lindsey's blog), that I've posted about previously, to name a few. I'm trying to figure out where I'm willing to compromise and where I'm not. I'd love to see your favorite kitchens. I will look and comment on every link left in the comments. I can't wait to see what you love! I really, really want a farmhouse sink. Nat, that would look so great! Subway tile and a farmhouse sink are both on my list. We'll see how far I get in persuading Ryan. Love the ideas! Here is a kitchen along those lines that I LOVE. Hope you like it too!! Megan, I love it!! The subway tile to the ceiling, the open shelves above the sink, the aqua door and i love the Eat above the oven. Thanks for sharing. erin, both those kitchens are amazing! the island in the first one is incredible. i love the exposed brick the wall paneling and the light fixtures in the second. thanks for passing them along. you are all giving me such great ideas. i am loving this! I don't have ideas. I'm just excited to see what you put together! Well, I guess this post answers more than one question. I think there is a lot similar about all three kitchens. Hold out for that farmhouse sink girl. I'm probably not going to help because I just agree with you!! I, too, love kitchen's similar to the one in the Diane Keaton movie "Something's Gotta Give." barb i really like those kitchens. i had forgotten about the one in that movie. thanks for reminding me! are you on Pinterest? because theres is a billion pictures of beautiful pictures on that site. i have to limit myself over there because I could get lost in all the beautiful house pictures for hours ;] lmk if you need an invite. erin, i will definitely check out pinterest, that is a great idea. kelly c. i love the green subway tile, that is a great twist, and the lighting, i agree is fabulous! thanks for the link. Since I'm not much help on how to make your kitchen pretty, I finally decided to google bad examples! I spent a great 15 minutes looking at "white trash kitchen images" on a google search. I absolutely love Nicole's kitchen ceiling. I would consider some type of texture on your ceiling. Also, the subway tile, really! 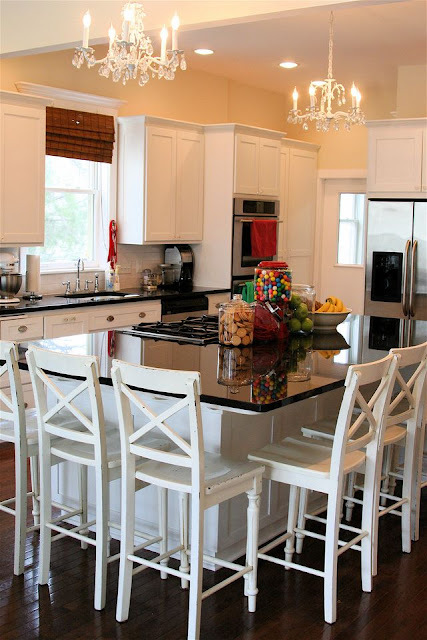 I think a different color island from the cabinets is to die for. I couldn't convince Scott to do it though. We didn't go with a full on farmhouse sink, but ours does just have one big basin and I absolutely LOVE it. I highly recommend one. It looks like you want white cabinets(love them!!! ), but since you asked to share what we love, if I could get my way, I would love green cabinets. @lauren, you crack me up. i love that you are searching kitchens I don't want. @dawnkristine i agree, textured ceilings are beautiful. @gustobones the green cabinets are beautiful! thanks for sharing. and included some pictures of what my ideal kitchen could be. I think this kitchen may be something you love. It seems to have a few things in common with the kitchen links you have already posted. Plus, I love that she painted her door. And her chandelier is to die for! ha ha. I just noticed someone already linked to the kitchen I suggested you look at. Good luck with the decision making!